PCS, The Punjabi Cultural Society of Chicago, hosted its fifteenth annual “Punjabi Youth Graduation and Scholarships Awards Night” on Sunday, June 14, 2015, at Viceroy of India Banquets in Lombard, Illinois. More than 250 attended. Professor Sanjay Mehrotra of Northwestern University was the keynote speaker. The guests of honor were Class of 2015 graduates from the Punjabi community. It was a treat for the graduates and the “Rangla Punjab 2015” program participants. The celebration included key note address, recognition awards, scholarship, cake cutting ceremony, DJ music, dancing, socializing, networking, and sharing delicious dinner. Professor Sanjay Mehrotra of Northwestern University Evanston Illinois who is also Director of its Health Engineering Center delivered the keynote address. Prof. Mehrotra was an inspiring speaker who spoke from the heart with his own personal life story and humble beginnings. “I was never at the top of my class, but belief and persistence helped me get to where I am today. To be successful you must have the courage to say no to the distractions that will come your way,” said Prof. Mehrotra, “you must be good and do good, and stay out of trouble, it is not a rocket science,” he added. Gurpreet Kaur Dhaliwal of William Fremd High School Palatine won the $1000 PCS Scholarship for her scholastic accomplishments, cultural programs participation, and community service. The scholarship and the graduation night dinner event was co-sponsored by the sisters Karamjeet Kaur, Diljeet Kaur, and Ranjeet Kaur Singh in fond memory of their father Dr. Pritam Singh a scholar, freedom fighter and an educationist with deep love for his community. The scholarship event was also co-sponsored by Mohina Ahluwalia in memory of her husband Diljit Singh Ahluwalia, Harinder Pal Singh (M.I.T.S. ), Dr. Surjit Singh Patheja, Raj Dhaliwal Power Petroleum, Amritpal Singh Sangha, and Lakhvir Singh Sahota. All Punjabi class of 2015 graduates were honored with PCS Certificates of Achievement. The participants of “Rangla Punjab 2015” a PCS Annual Vaisakhi cultural program held in April also received their appreciation awards. The awards were distribiuted by Amrik Singh Girn, Gurdeep Singh, Nick Balwinder Singh & Happy Multani. The party was free for the graduates and Rangla Punjab participants. Prof. Sanjay Mehrotra, Mona Ahluwalia, and Harinder Pal Singh were honored with plaques by the PCS officials. Surinder Jain of Vice Roy was also given a plaque for his support. Mahijit Singh Virdi, Mandeep Singh, and Avtar Singh Multani performed Punjabi songs to entertain the gathering. Twin Beatz D.J. provided the bhangra music for the party. PCS President Vick Singh welcomed the guests, and PCS Chairman Amritpal Singh Sangha congratulated the graduates and complimented them as the stars of the evening. "The purpose of this program is bonding and community building. It is to promote higher education among our next generation. Our children need appreciation, encouragement, and professional guidance," said Vick Singh the P.C.S. President. An independent panel of judges selected the winners from the applicants according to a grading criterion established by PCS, which is based on academic achievements, extracurricular activities, and volunteer community service. The scholarship coordination committee comprised of Gagandeep Singh Multani, Raibarinder Singh Ghotra, Parvinder Singh Nanua, Bikram Singh Chohan, Pardeep Singh Deol, Surinder Singh Sangha, and Sunny Kular. The event was organized by Vick Singh, Gurmit Singh Dhillon, Bikram Singh Chohan, Surinder Singh Palia, Parvinder Singh Nanua, Manjeet Singh Bhalla, Gagandeep Singh Multani, Raibrinder Singh, Pardeep S. Deol, Surinder Singh Sangha, Balwinder S. Girn, Mohinderjit Singh Saini, Bhinder Pamma, Ronny Kular, Sunny Kular, Rajinder Singh Mago. PCS' next event is Sports Festival on Sunday August 2, 2015 at Falcon Park Recreation Center, 2195 N. Hicks Road in Palatine Illinois. 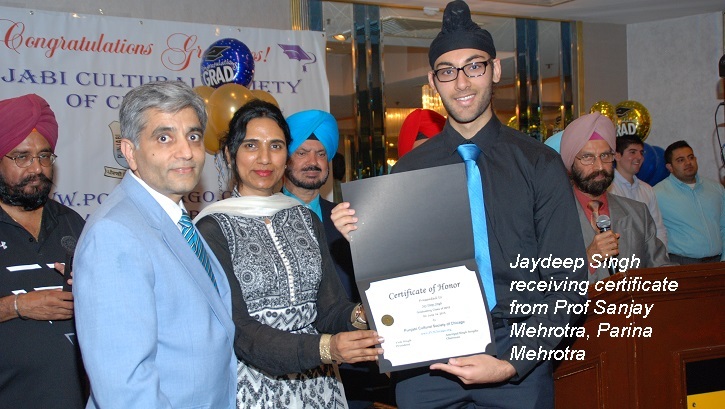 "Class of 2015" Graduates, and “Rangla Punjab 2015” cultural program participants honored at the Graduation and Scholarship Awards Gala Night organized by Punjabi Cultural Society of Chicago on June 14, 2015, at Viceroy of India Banquets, Lombard, Illinois. More than 250 attended the dinner and dance celebration.